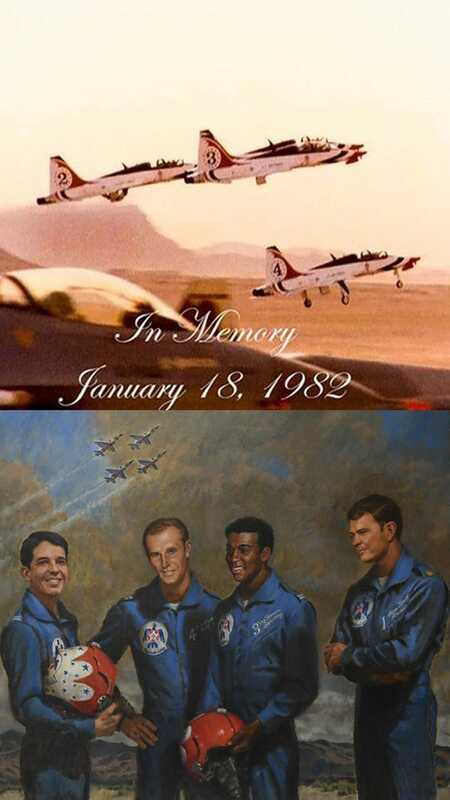 This day 35 years ago, the “Diamond 4" — USAF Thunderbirds #1-4 were killed at Indian Springs Aux. Air Field (now Creech AFB), Nevada, while practicing for the upcoming 1982 airshow season in their T-38s. This crash claimed the four demo pilots lives. This photo was the last picture taken as they took off from Nellis that morning. Every time our pilots step to fly they pass this mural and remember the legacy and courage of those amazing Airmen. Commander/Leader Major Norm Lowry, Left Wing Capt. Willie Mays, Right Wing Capt. Pete Peterson and Slot Capt. Mark Melancon - lest we never forget.